Taste asparagus, wild garlic, morel or rhubarb! in May you can taste outstanding, healthy and delicious menu made with white and green asparagus. Also there are spring surprise made with wild garlic, morel or rhubarb. For more information about the daily offer please ask your waiter. You can also order the asparagus*. If you are interested in please contact your waiter. He will explain you the conditions of the order and delivery terms. Dear guests, come to my restaurant ALBRECHT and taste new menu that I have prepared with my team. The combination of tastes and my handwriting in the design of the meals are awaited you. Try to taste langoustines or quail from starter offer. 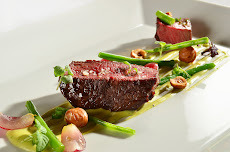 There are amazing asparagus soup, the char or fallow deer on menu list. And when you are fan of the desserts, don not leave restaurant without tasting the poppy or figs. I did not mention other tasteful meals that you can try in my restaurant. That is one of the reasons why to come to ALBRECHT and try new menu list. April 10th, 2013 at 7.00 p.m.
Let us invite you to the dinner when you can taste unique champagne BILLECART SALMON with great tasting menu by Jarda Zidek. It is going to be unbelievable taste and visual experience. Date: March 14th, 2013 at 7.00 p.m.
Let us invite you to the dinner when you can taste unique „new cuisine made by Prague“of Mirek Kalina and Jardo Žídek. It is going to be unbelievable taste and visual experience.